This nomad man lives in Yushu prefecture between the Bayan Ka La mountain pass and the small town of Domda in northern Kham province . He is actually a distant relative of a good friend of mine. The elevation of the area is 4400m / 14,432ft above sea level. The region is almost 100% nomadic with many people living in black yak hair tents year round. 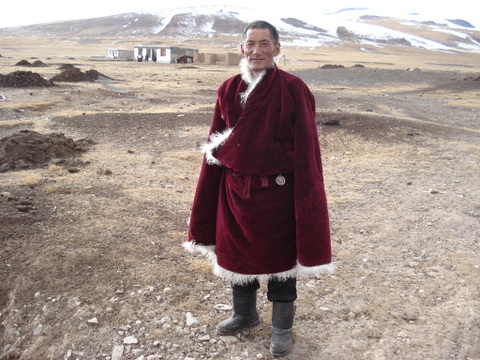 This man's coat is unique among the nomads of Kham and is very expensive. It is lined with many sheep furs which help keep you warm when the temperatures get down to -25C or colder.